Composition Scheme is a simple and easy scheme under GST for taxpayers. Small taxpayers can get rid of tedious GST formalities and pay GST at a fixed rate of turnover. This scheme can be availed by any taxpayer whose turnover is less than Rs. 1.0 crore. The composition scheme is an alternative method of tax levy under GST designed to simplify compliance and reduce compliance costs for small taxpayers. The composition scheme is applicable to manufacturers or traders whose taxable business turnover is up to ₹1.5 crore (₹75 lakh in case of North-Eastern States). A service provider can opt for the scheme if his taxable turnover is up to ₹50 lakh. 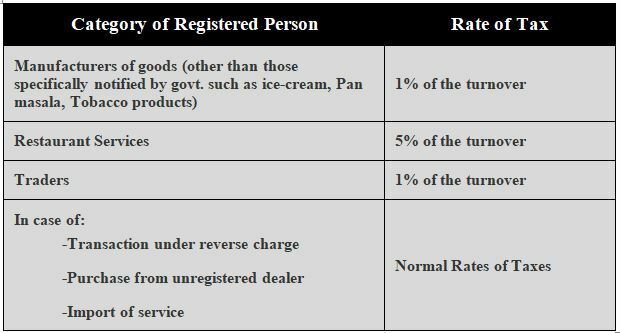 The applicable tax rates under the composition scheme are 1 per cent (0.5 per cent Central GST and 0.5 per cent State GST) of turnover in case of manufacturers and traders, 5 per cent in the case of restaurants (not serving alcohol) and 6 per cent for other service providers. The tax is to be paid from tax payer’s own pocket without charging it to the customer. 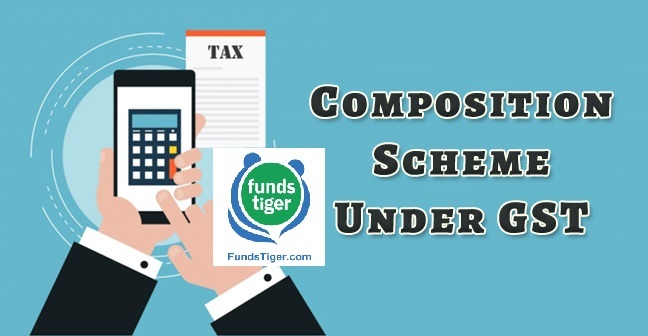 A taxpayer whose turnover is below Rs 1.0 crore can opt for Composition Scheme. In case of North-Eastern states and Himachal Pradesh, the limit is now Rs 75 lakh. As per the CGST (Amendment) Act, 2018, a composition dealer can also supply services to an extent of ten percent of turnover, or Rs.5 lakhs, whichever is higher. This amendment is applicable from the 1st of Feb, 2019. Further, GST Council in its 32nd meeting proposed an increase to this limit for service providers on 10th Jan 2019. Note: CBIC has notified the increase to the threshold limit from Rs 1.0 Crore to Rs. 1.5 Crores. Who cannot opt for Composition Scheme? How to avail Composition Scheme? To opt for composition scheme a taxpayer has to file GST CMP-02 with the government. This can be done online by logging into the GST Portal. This intimation should be given at the beginning of every Financial Year by a dealer wanting to opt for Composition Scheme. Instead of filing 3-4 returns monthly, taxpayers registered under this scheme will be required to file returns once every quarter. GSTR 4 must be filed by 18th of the month succeeding the relevant quarter. A registered taxable person paying tax under the provisions of Composite Scheme shall furnish a return for each quarter in the prescribed form in the prescribed manner within eighteen days after the end of the relevant quarter. GSTR-4 has been prescribed by the government as a tax return form to be filed by a dealer under Composition Scheme. Composition dealers need to furnish the first return for the period starting from the date on which they become a registered taxable entity till the end of the quarter in which the registration has been granted. An annual return GSTR 9A also needs to be filed by the 31st December of next financial year. The option to pay Goods and Services Tax (GST) at reduced rate of 6% would be effective from the beginning of the financial year or from the date of obtaining new registration during the financial year. Service providers opting for the composition scheme can charge a lower tax rate of 6% from customers, as against the higher rates of 12 and 18% for most services under GST. In a circular, the Central Board of Indirect Taxes and Customs (CBIC) said suppliers who want to opt for composition scheme would have to file Form GST CMP-02 by selecting ‘Any other supplier eligible for composition levy’ latest by 30 April, 2019. Is there a GST on a resale home loan?